Softball. I love the game, growing up playing, I know gained more than just the love of the sport along the way. Some of my very best friends are girls I shared a dugout with or played against more than 35 years ago. Both our girls have played, Mady enjoyed a year with the Bruisers (loved that season & team of girls!) but horses are her first true love. She has now officially taken on the role of “Most Supportive Sister” to Mackenzie (aka Big Mack or Mack Attack, depending on who you ask) who is all about softball. 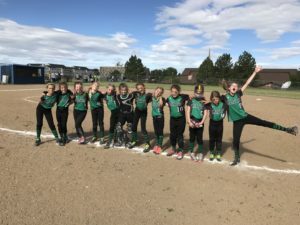 Big Mack made the Kalispell Emeralds 10U Travel Softball Team and we kicked off our first summer tournament this past weekend at the Zootown Fastpitch Softball Classic. Saturday was tough, the girls lost all 3 games they played but learned a lot. 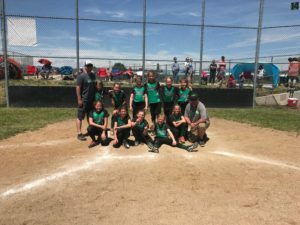 It was their first time playing together as a team, and knew going in they would need to take each play, each inning & learn how to work together & give their best. The most important thing about Saturday was the hard fought battles did not take the spirit out of our girls, they truly grew together. Sunday’s first game had us paired up against a team out of Spokane, and our girls showed up with all heart. They rallied to win the game! First Win as a team! We went on to beat Electric City Heat from Great Falls for the Silver Bracket Title. It was a tough battle but the girls rallied to beat them and bring home the win having the fans on their feet. Heart. They played with all of heart coming together in a way that I didn’t anticipate. Shout outs to Jaidyn in the circle. She lead the team pitching her heart out. I loved the way her eyes smiled through her face mask, she was having fun and it made it so fun to watch! Ellie squeezed more pitches behind the plate then I could count, she worked with Jayden pitch after pitch, protecting her turf and working hard for her team. Kyleigh and Charlotte for battling through, Charlotte took a ball to the eye and walked away with the best black eye of the weekend. It didn’t stop her from catching a fly ball and making a double play. Kyleigh had an excellent play Saturday against a Columbia Falls team, with bases loaded, batter hit foul ball to 1st base dugout, Ky caught it, tagged 1st base and then threw to 2nd getting runners out who didn’t tag up. She went on to have a collision at home plate that left her with a fracture to the tibia but she stood in the box to start off our last inning hitting rally to win Sunday. Taylor and Rylee had great pop fly catches. I love Taylors job at the plate, that girl is gonna send one for a long ride before this season is over. Rylee, Addison & Madison for starting the weekend shy in the batters box and swinging away to all have hits in Sunday’s games. Kiera truly embraced her fielding position, making key stops and her beautiful hit Sunday sparked the fire that spread throughout the inning & leading the team through the batting order. Nakiah worked so hard in the field and at the plate, she shows up and she is ready to play something you just can’t teach. Addison is a true joy, she really shows her heart the most, she cares for her team and her sweet spirit is contagious to be around. As for Big Mack, she did a solid job in the field and was aggressive at the plate. We joked about “no high cheese” until she has two strikes on her. I have feeling we will see some power hits from her too. Special thanks to Coach Beau, he took on the role of coach for our girls out of pure love for the sport. What impressed me most this weekend watching him with our girls, was excitement and fire that came out once the game started. When first meeting him, he seemed so quiet and shy, but when the girls hit the field he didn’t stop, he used many moments to teach the girls while encouraging them in such a positive way. And to Assistant Coach Dan, for giving the same positive and encouraging attitude with our girls. I enjoyed how well you and Beau worked together to bring out the best in all of our girls, and I know I’m not alone when I say that I am really looking forward to watching you continue to work with our girls in the coming weeks. To all the “fans”, the parents, families and friends who cheered the girls along each step of the way, your love and support made the weekend the best. I think we are all pretty lucky to have such a great group of girls. Mack was lucky to have an extra big group of fans with her Papa & Mina, Aunt Renee & cousin, Tyler, and Uncle Jason, Aunt Holly & cousins, Bo & Bellamy cheering her on. 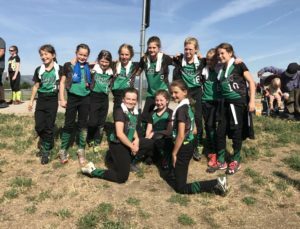 Kalispell’s Emeralds Softball Teams were well represented. Winning the Silver Bracket for the weekend wasn’t the sweetest part though… yes, there’s more! 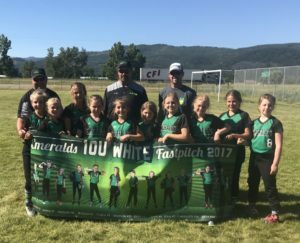 The icing on the cake to finish off Sunday was our other 10U Kalispell Emeralds Team won the Gold Bracket, beating out the hometown favorite, Bitterroot Sparks, and making it a sweep for the Kalispell girls. I know that their is a lot of pride in the hearts of many coming home on Sunday!! As for this mighty team of girls, they have three more big tournaments ahead, I’ll keep you posted on their progress in the weeks to come, I know in my heart we will see them continue to flourish.